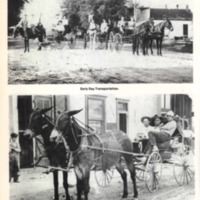 Section of the Macksville Centennial Book dealing with transportation and miscellaneous photos. Macksville History Committee and The Lewis Press, “28- Transportation,” Digital Macksville, accessed April 22, 2019, https://macksville.digitalsckls.info/item/30. Fred Hopley left with his team 1917. Howard Frink age 19 years. First car Mildred Hankins rode in belonged to Walter Hartronft 1911. Charley and Kate Satterlee, Thurman driving 1909. The story of the automobile is one of the most remarkable chapters in the history of man. Our 20th century culture is based almost entirely on the mobility created by the automobile. The auto industry is America’s No. 1 industry and one person out of six is employed directly in it. The first road vehicle that could travel by itself was steam powered, built by a French Army captain in 1769. By 1830, steam carriages were providing regular passenger service in England. Many American inventors experimented with steam cars in the late 1800’s. Among them were R.E. Olds and Francis Stanley. During the 1890’s, electric cars became popular but speed and range were limited by the batteries they required. The general design of the gasoline automobile as we know it was first built in France in 1890 by Emiel Lavasser and Rena Panhard. Mobility arrived in America in 1893 with the Duryea Brothers’ first primitive car. They Duryea car was quickly followed by gasoline cars built by Elwood Haynes, Ransom Olds, Henry Ford, Alexander Winton, and James Ward Packard. By 1900, production of all auto makers totaled about 400 cars, but in 1901, two events took the auto industry a giant step forward. Huge oil deposits were found in Oklahoma and Texas, and Ransom Olds developed the mass production technique. By 1902, he was able to produce over 4,000 sturdy little curved-dash Old-smobiles and bring the price down within reach of most middle class Americans. Henry Ford soon improved Olds’ production technique with his famous “Model T” and brought his automobile down to as low as $385, within reach of almost everyone. By the early ’20’s, over 3,000 different auto makers produced cars in America, and by the end of the decade, total production reached 4 million cars per year. The Great Depression cut production to nearly one third of what it was in the Roaring ’20’s and the auto industry became a mere shadow of what it had been. Most of the once great names in automotive history went by the wayside, while others merged to survive. The intense competition of the depression years brought some of the greatest engineering and styling advances. During this period, some of the largest and most elegant cars ever built appeared, during what has sometimes been calle the Golden Age of the Auto. During the four years of World War II, five million Americans went to war to defeat the axis powers. During this time no new cars were built. When these five million Americans returned to civilian life, they helped create a demand for new cars that would not be satisfied for six years, into the 1952 model year. After this period and into the late ’50’s, competition again became very intense as it had 20 years earlier. More famous auto makers either merged or went out of business bringing the total down to only four. During the late ’50’s and early ’60’s, there was no worry about war, gas shortages, or recession. Gasoline was as plentiful as water and almost as cheap. The federal government poured billons into the interstate highway system. Cars grew larger, more powerful, and more elegant. Styling became extravagant, flamboyant, and, above all, glamorous. The great oil shortages of the ’70’s and recession of late ’70’s and early ’80’s created the trend toward the World Car with components built in many different countries and with the emphasis on reliability, utility, and economy. The automobile has been the center of our American culture and lifestyle for over three quarters of a century, longer than most of us have lived. To many of us, the automobile has been more than transportation. Our cars have been objects of personal expression. We have treated them and cared for them as living creatures with their own personalities. We see them not only as objects of expression, but of art and beauty. Forerunner of the tricycle, Donald Sparks. John McKibben and Golda Sparks. Taken in 1929. Mrs. M.C. Oilers’ brother and wife Mr. and Mrs. Lensey McKinney of Seaford Del. This is the front of where ice was sold. Mrs. Jennie Lock bought eggs and cream also in this building. Kephart Insurance Agency. Richard Weers, Larry Schmidt, Myra Schmidt, owners since 1976. Paul Schnoebelen at the line-o-type. Editor of Macksville Enterprise. Virgil and Virginia Goudy, Linda and Louise, 1961. Louise, Virginia, Virgil, Linda Goudy, 1961. Built in 1951 - Emil and Mary Frick Memorial. New maintenance building, built in 1986 with money put into an improvement fund over the years from Emil and Mary Frick memorial fund. 1917 Alta Merrick, Willis Hankla, Andrew Merrick and Jack Merrick listing in corn between Belpre and Macksville. Imperial Cafe - 1922, Grandpa Hill, Jennie Howard, Fern Howard. Joe Wolf Garage, east side of Main Street. Decoration Day 1919 Macksville. Left to right: George E. Mack, Creed Stark, Judge Hamilton, Charlie Hatch, J.J. Sweazy, Franklin Stanley, W.T. English, Hardy Stark, Dugan, Frank Jennings, Treadway, George Mefford. Fire in the main block of Macksville, year 1911. The man with the cane is Ed Carrothers, who was the father of Bella Biggs, and the great grandfather of Verlan Biggs. Early day businesses, Mack Hardware, Alford Drugs and Pinney Furniture.